Dr. Carolyn Acorn grew up on the north shore of Prince Edward Island. Her interest in Optometry began when she had to wait for more than six months for a routine eye examination. Dr. Acorn completed a Bachelor of Science with a major in Biology at the University of Prince Edward Island before continuing on to the University of Waterloo for her Doctor of Optometry degree. Following graduation, Dr. Acorn spent an extra year at the University of Waterloo and completed a residency in Low Vision and Geriatrics. Dr. Acorn spent some time working in Ottawa Valley after her residency ended but she and her husband were soon drawn back to the Island. Since January 2000, Dr. Acorn has been part of the team at Drs. Hickey, Burke & Associates. 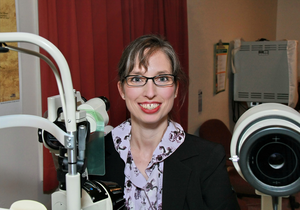 Professionally, Dr. Acorn has served on the Prince Edward Island College of Optometrists, and is currently part of the executive of the Prince Edward Island Association of Optometrists. She is also a volunteer for the Arthritis Society and serves on the parent board of a local daycare. Dr. Acorn has two children and a pet dog and enjoys family time.